How Many Will They Hold? 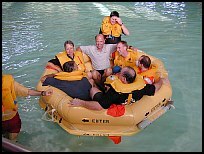 Life raft capacity is rated based upon a variety of possible factors including floor area, seating space and buoyancy. Rated capacity is the number of survivors the raft is supposed to hold with a minimal amount of space for each survivor and a certain degree of buoyancy. TSO C70a provides for a whopping minimum of 3.6 square feet per person, or using a seating demonstration method, a minimum of no less than 3 square feet, along with certain other limiting dimensions. Only one raft we evaluated, from Air Cruisers, didn't meet the 3.6 sq, ft. per person standard. Their 13-person raft provided only 3.36 sq. ft. per person. While they assured us that it did, indeed meet that standard (guess our tape measure shrunk), Air Cruisers also said that it meets the requirements of the TSO via the alternative compliance methods provided (para. 4.1.1). It may, but it's too small in our opinion. Some of the rafts provide a bit more room and the configuration and shape can make a difference, but any way you slice it up there isn't much room. "Close" takes on a whole new meaning in a life raft, as can be seen to the right. Worth noting is that marine life rafts use a 4 sq. ft. per person standard and a few aviation rafts actually meet that standard, Winslow's Ultra-Lights for example. They are still crowded. It is so tight that I recommend that those for whom a few extra pounds and a few inches one way or another in payload will not make a big difference, ought to seriously consider going up one or two sizes if they purchase a well ballasted raft. For example, if you need a four person raft, you might want to consider a five or six person raft. In a raft without effective ballast, it is better to stick with the rated capacity, maximizing the ballast effect of the survivors. Besides their rated capacity, aviation rafts also have an overload capacity. Generally this amounts to half again more than the rated capacity, six people, for example, in a typical four-man rated raft, Nine persons in a 6-person raft. As you might expect, if it is tight at rated capacity, you are packed like sardines at overload capacity, as can be seen here to the left. It makes for extreme discomfort and short tempers. The manufacturers usually take pains to clearly delineate the difference between the two, i.e. : "4 person capacity, 6 person overload". The exception is Survival Products who list their non-TSO'd rafts in some of their literature and, in fact, printed on the raft and valise itself, as, for example, "4 to 6 Person" and "9 to 13 Person" and RFD's Navigator raft which is rated at "4/6 Persons." These are very misleading, in my opinion. Based on calls made to companies who offer the rafts for sale or rent, we found that most make no distinction about the raft's capacity in the case of the SPI rafts, probably based upon the manufacturer's own misleading presentations. Buyer beware. EAM also sells a line of lower priced, non-TSO'd rafts, its "EAM" series. Some of these rafts are rated at higher capacities, even though they are sized exactly the same as the TSO'd rafts. For example, the EAM-5 (5-person) is the exact same size as the TSO'd 4 person raft. EAM explained they do this to compete against "the others," using SPI's rating as an example. Due to overcrowding, I would caution against relying on EAM's inflated capacity ratings for these non-TSO'd rafts, just as with SPI's misleading capacity ratings. We tested all the rafts at both their rated capacity and all but some of the largest at their overload capacity. Even at the rated capacity they were all uncomfortably crowded. At the overload capacity they were simply unmanageable and other potential problems were also distressing evident. Freeboard (the distance the raft rides out of the water, in other words, the distance from the surface of the water to the top of the raft's buoyancy tube) is reduced significantly when overloaded. With most single tube rafts, which have minimal freeboard to begin with, this simply exacerbates the problem. In any but the calmest water, the raft will be underwater, though it may still be providing some degree of buoyancy for survivors. When you select the capacity raft you want, rely only on the on its listed rated capacity, never on its overload capacity. If carrying six people, get no less than a six person raft, not a four person raft with six person overload capacity. For SPI's non-TSO'd rafts, the first number they list is the rated capacity. There has been considerable confusion among many raft purchasers and users about what is required and what is approved. This has often been aided and abetted by misleading nomenclature and, in a few instances, by patently misleading advertising by some manufacturers. The FAA hasn't been clear on this itself at times. Requirements, i.e. : what type of raft ("approved" or not specified) and what minimum equipment for the raft must be on the aircraft, are dealt with in the FARs dealing with equipment for "extended over water operations" (Parts 91.509 and 135.167 for example). Each subpart has a list of required raft equipment that differs from one to the other. Approved rafts, required under these FARs, must be manufactured by an FAA certificated manufacturer in accordance with designs approved by the FAA to meet the standards of the applicable TSO, in this case TSO C70a or its predecessor, TSO C70 or C12a (though C12a is largely irrelevant at this point with regards to general aviation rafts). The TSO stipulates the minimum design criteria and materials and performance specifications that must be met as well as some minimal raft equipment that must be included. The manufacturer is supposed to prove to the FAA that the raft meets the TSO criteria before TSO approval is granted by the FAA. It is supposed to be a rigorous examination and series of tests and generally speaking, no significant leeway is supposed to be allowed from the TSO requirements unless the applicant can convince the FAA that its design results in an equivalent level of safety. Remember that point as it is important later on. Probably the most notable change between TSO C70 and TSO C70a involves the design of single tube rafts and the effects of a cell deflating. The older version has no requirement that the occupants be kept out of the water if a cell is lost, the newer version does. This would be a significant point if any of the rafts actually met this standard, which they don't in our opinion. For those operations which require a life raft pursuant to the FARs, there must be both a life raft of the appropriate type and it must be equipped with all the applicable equipment listed in the FARs. In other words, a Part 135 operator needs an approved raft (in other words, it must be TSO'd) equipped with the minimum equipment listed in 135.167(b)(3). So far, so good, but now it gets confusing. Many manufacturers make both TSO'd and non-TSO'd rafts and some make only TSO'd rafts. In some cases the differences are slight, in some cases major. One thing they all have in common is they all use FAA approved material, all of it from two suppliers, each of which is the only producer of a single type of FAA approved material, so even the ones whose rafts aren't TSO'd can legitimately claim that the rafts are constructed from materials "conforming to stringent government specification" or "approved by the FAA." They may also legitimately claim to hold an FAA certificate since they may be licensed to service rafts as an FAA approved repair station. Both these statements may confuse the unwary buyer. What gets even more confusing is the claim to offer FAR Part 91, 121 and 135 kits as options for the non-TSO'd rafts. In fact, the kits they offer may, indeed, include the items specified in the FARs. BUT, the kits, no matter what they call them, together with the unapproved non-TSO'd rafts are not legal, pursuant to the FARs, if an approved raft is required. You might be hard pressed to figure that out from some of the sales brochures or sales pitches you get. A pilot who really wants a TSO'd raft, even if they aren't legally required to have it, and just figure they want one that the government has blessed, can often be bamboozled. To say nothing of those who are required to have a TSO'd raft and the appropriate equipment -- they also have been known to purchase the wrong raft, much to their chagrin when the mistake is caught on an FAA inspection. With FAA "encouragement," EAM, who makes both types of rafts, changed its nomenclature to eliminate the confusion, no longer referring to the optional equipment kits for their non-TSO'd rafts by the FAR Part reference. One manufacturer who has contributed a great deal to this confusion over the years has been Survival Products. Their somewhat misleading advertisements have been a source of trouble for more than one less-than-keen-eyed operator, to say nothing of many even less knowledgeable consumers. While Survival Products used to be an FAA certificated repair station, even that approval was pulled a number of years ago due to discrepancies. Apparently the problem has become bad enough that the FAA has felt it necessary to issue "Unapproved Parts Notification," a warning about the company's products and misleading advertising. They have since cleaned up their act considerably and as noted, have also introduced a line of TSO'd rafts, but many of these rafts are still in circulation and the confusion persists. Then, there is the question of who is required to have what kind of raft. Life rafts are mandated for only some over water operations per the FARs. Those of us who fly light general aviation aircraft under Part 91 are not required to have a life raft on board for any normal over water operations (Note that, practically speaking, crossing the North Atlantic involves Canadian regulations which do have such requirements). Not required perhaps, but still, you ought to have one, in my opinion. Part 91.509 "Survival equipment for over water operations" is part of Subpart F dealing only with Large (over 12,500 pounds MTOW) and Turbine-Powered (jet or turboprop) Multiengine Aircraft. This doesn't cover your Cessna 182 or any other light GA aircraft, single or twin. 91.509(b)(2) requires "Enough life rafts. . ." Note there is no mention of "approved" life rafts. This is a real sore point for some folks, like those manufacturing TSO'd rafts, who insist that the raft must be TSO'd. I asked the FAA in the Washington, D.C. headquarters, who could only point us to an older Advisory Circular (AC91-38A) which says "The liferaft requirements of Section 91.189(b)(2) (ed. - now 91.509) may be met by using: (1) Liferafts approved under FAR 37, Section 37.122, and marked TSO-C12c. (2) Liferafts approved under FAR 37, Section 37.176, and marked TSO-C70." However, the AC is just that, only advisory in nature, and also, note specifically the word "may." There seems to be no regulatory basis for requiring a TSO'd raft for Part 91 operations. Further support to that interpretation is given because Part 135.167(b) says "Enough approved life rafts. . ." which clearly requires an approved raft which means it must be TSO'd. A typical FAA muddle, your best bet, if it's a concern, may be to get the FAA to issue you a written ruling, possibly avoiding problems over interpretation later on. You wouldn't expect it would make a big difference. In the large and expensive aircraft covered by 91F, you'd think most folks would want a TSO'd raft. Well, seems some of these folks got their money by pinching pennies and try to go with the cheapest product, even if it means a significant reduction in safety. In many cases they simply do not realize that to be the case. In other cases, they simply take what the aircraft manufacturer supplies, which may not be the best, simply the manufacturer's choice, for whatever reasons they may have. Often simply because it is the smallest or lightest available, with no concern for the protection actually provided. Like pilots and operators, however, in many cases they may not recognize the difference either. Another problem is that, as we note later in this text, even some TSO'd rafts don't cut it and many have switched to non-TSO'd rafts which offer better performance and this really creates conflicts and controversy.